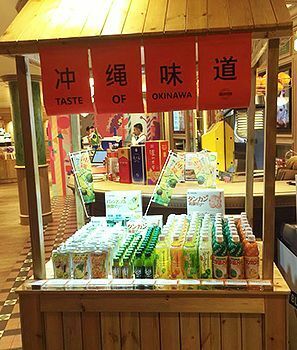 JA Okinawa (Tsutomu Oshiro, chairman) has been hard at work creating momentum for their overseas sales of their agricultural and livestock products since April of this year. At the start of 2018, the organization had a sales goal of 100 million yen, however as of the end of October they are reporting sales of 55.2 million yen, showing strong momentum to surpass that goal. In particular, the livestock products consumed on cruise ships are popular, and they have shipped nine tons of Okinawan wagyu beef, and one ton of agu pork. Within their year-to-date totals, livestock goods such as meat total 44.38 million yen, processed goods such as drinks and brown sugar total 6.81 million yen, and fruits total just over 4 million yen. In April and August of this year, JA partnered with the cruise liner and resort holding company Genting Hong Kong. This has strengthened shipments to the four ships owned by Genting that call to port in Okinawa every week, and has increased exports. By using these ships to ship goods, transportation costs are reduced, and they are also able to ship meet processed at the meat processing facilities within Okinawa. From now, JA Okinawa is actively shipping winter to spring vegetables in an effort to further expand sales.